Saturday morning I headed out with Mark (D-23) and we fished from 7 to 10:30. We ended up 3 of 4 and took 3 nice kings in the 6 to 10 lb range. The action was good early but we just drove around for the last 2 hours. We were mostly just South of Holland and in 80-110 FOW. Back at the dock I talked to few people that did much better than us (8-10 fish) but were fishing further North. This set the stage for our trip the next day. I went out again with Mark on Sunday morning and we got up little earlier and fished from 6:30 to 11:00 and ended only 2 of 5. 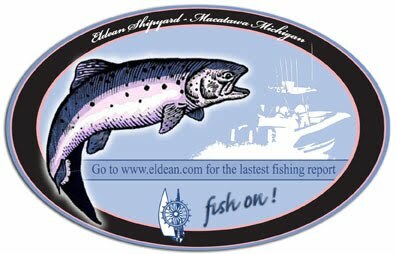 We headed North and fished mostly half-way between Holland and Port Sheldon from 70 to 130 FOW. Unfortunately the good advice from the day before didn't turn into more fish. We did loose 2 fish to broken lines. One fish came on a meet rig and the other on a blue dolphin spoon.